Purchase for a friend, relative or a loved one. It's easy, affordable and makes a great gift at any occasion.
? 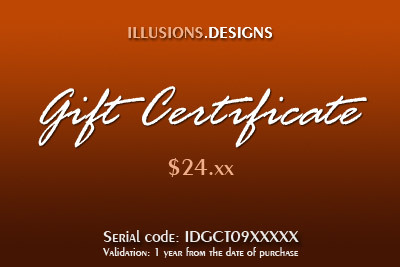 Make your purchase of one or more Gift Certificates.
? You can redeemed yourself or give it to a friend, relative or loved one.
? Your friend must give us the unique Serial Code on each Certificate in order to receive the merchandise.
? The Certificates are valid for 1 (one) from the date of purchase.
? Its a great money saving and makes it a great gift.